Golden Records is a fully featured archery club record keeping program. Adaptable and customisable it keeps records by each season. You maintain a list of club members for whom records are to be kept, along with a customisable list of rounds and bow classes. Track awards easily. Comprehensive reporting. Automatically updates handicaps and classifications. Are you an Archery Club Records Officer? Would you like to make your job of keeping records easier? Well now you can! 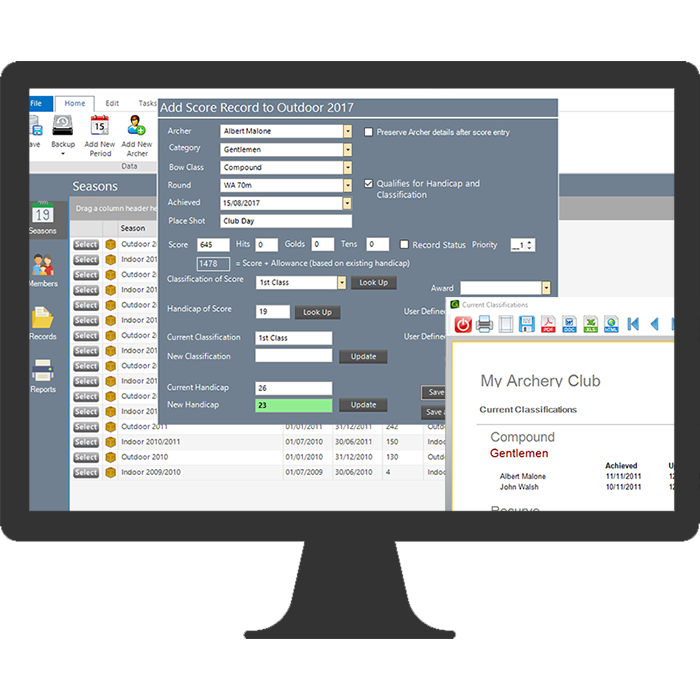 Golden Records is a fully featured archery club record keeping program. Adaptable and customisable it keeps records by each season. You maintain a list of club members for whom records are to be kept, along with a customisable list of rounds and bow classes. As you get score records coming in, enter them into a master records table, no need to find the records for the individual archer, just pick his/her name from the list and add the score and other details. Track awards easily. Comprehensive reporting. Golden Records will also track Club Records and automatically create a new club record if a better score is shot. If a club member wants to see his/her records just select his name to get a full list of the records for that member. Personal best and handicap improvement reports also available. 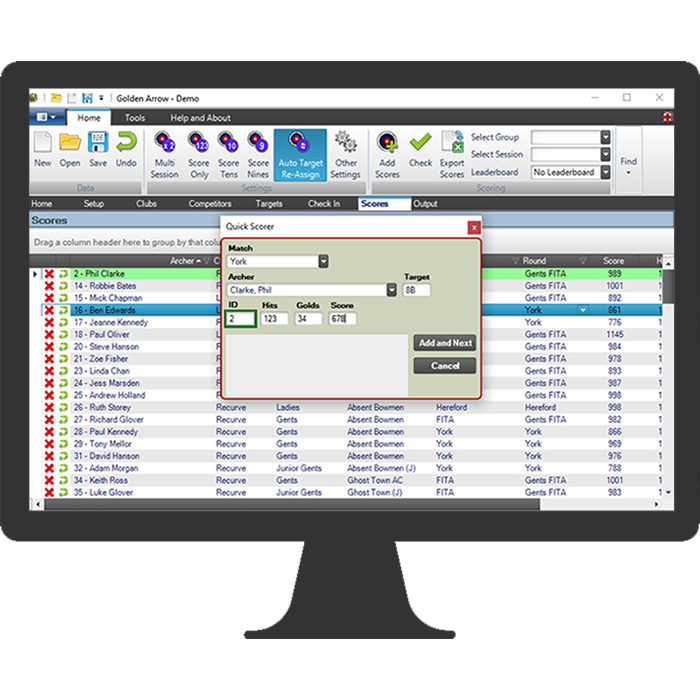 Customisable reports on records, scores, handicaps and classifications can be run and viewed within Golden Records and exported to PDF, MS Word or MS Excel (or compatible programs). Full backup and restore function included to safeguard your data. The database can be stored on a separate drive or on a network (simultaneous use by multiple users not supported). 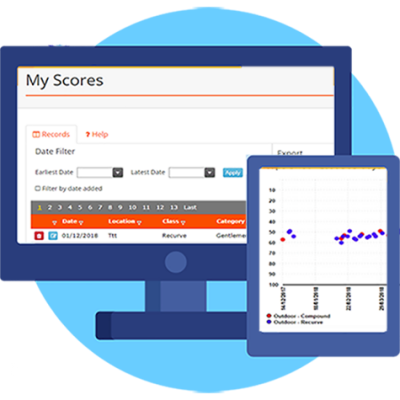 Optional – Add Cloud functions to synchronise data between computers and allow members to submit scores online, and to share records online with members and club officials. License permits use on 2 computers, for example on a desktop at home and on a laptop at the club. Golden Records will look up Archery GB Target classifications for the score, round and category and enter these sutomatically while calculating any improved classification. 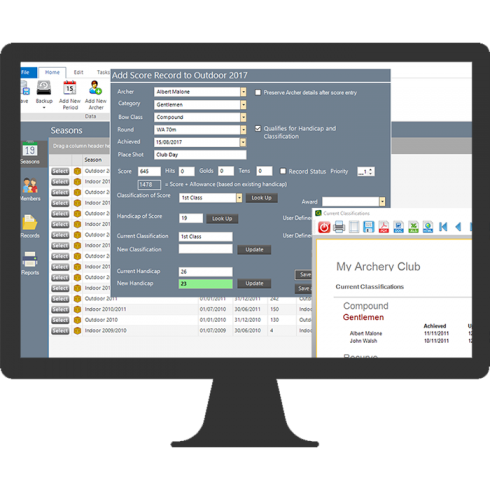 The Archery GB Handicap Tables are also included under license and Golden Records will look up handicap values on score entry. The calculation of handicaps is automated and archers handicaps are reduced automatically if a lower handicap is shot. Golden Records will also handle the year end re-assessment process to Archery GB rules. Includes current Archery GB Handicap and Classification data. Pick name from a drop down list along with bow class and round, enter score and job done! Golden Records will look up Archery Australia Ratings and calculate automatically the current archer rating and classification. Golden Records will calculate the 144 arrow score equivalent. Support for Archery NZ Ranking calculation will be in a future release. We offer a free service to import data from ArchRecords into Golden Records. Contact us for details.